Enjoy a delicious brunch and see historic sites along the harbor. 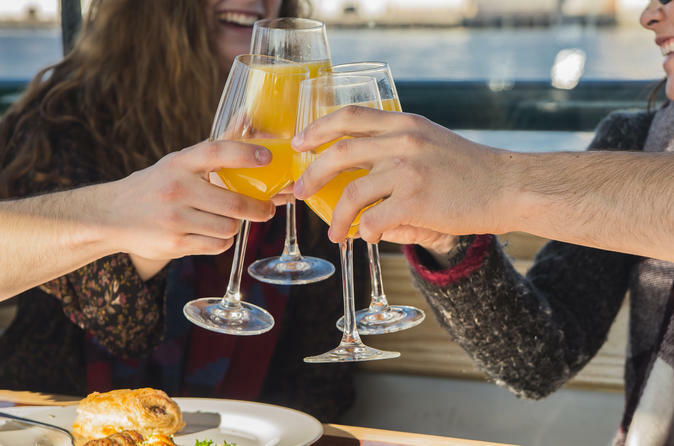 This 2.5-hour brunch cruise will take you around the harbor with drinks available for purchase. The sights you will see are the harbor islands (Castle Island, Deer Island, Spectacle Island, Long Island, Lovells Island, Georges Island, Independence Fort, Bunker Hill Monument, USS Cassin Young, USS Constitution, Old North Church, Boston’s Seaport District with historic Fishing Markets, and Boston’s incredible skyline. Please note: Beginning on November 15, 2018 and moving forward this event will be 2 hours. Enjoy this 2.5 hour harbor cruise with brunch. Panoramic views of Boston will provide opportunities to see Castle Island, Deer Island, Spectacle Island, Long Island, Lovells Island, Georges Island, Independence Fort, Bunker Hill Monument, USS Cassin Young, USS Constitution, Old North Church, Boston’s Seaport District with historic Fishing Markets, as well as Boston’s incredible skyline. Please note: Beginning November 15, 2018 and moving forward this event will be 2 hours. Enjoy a gourmet brunch buffet and select a cozy seat aboard the yacht as you cruise around Boston Harbor to capture panoramic views of Boston. This is the perfect event for groups looking to entertain guests from out of town. You can see the sites without giving up a relaxing weekend. Small bridal parties or even morning after wedding parties can be accommodated. The brunch cruise offers the perfect event for the individual or the group looking to celebrate and relax. Bloody Mary and Mimosa available for purchase by credit card only from the bar.